Over the last few months, I’ve spent a lot of time talking to students from my online cooking school. I always enjoy chatting on the phone or Skype with my students from all over the world. It’s fun but more importantly it gives me valuable insights into what people need help with. One of the best antidotes to this ‘affliction’ is to be a bit more organized. But I know there are some myths that hold people back from getting on top of it. So let’s get into some myth busting! Myth 1. If you’re organized there’s less flexibility and freedom. This ties in with the misconception that being organized means you have to pre-cook loads of complete meals. If you focus on prepping ingredients instead there can be loads of room for flexibility and creativity. I find it actually sparks ideas. And even better, cooking this way means you can ‘pull together’ healthy meals really quickly which means you’re much more likely to eat at home. Myth 2. You have to spend hours in the kitchen sacrificing your precious weekend time. People often tell me that a lack of time is their biggest obstacle on the path to organization. But here’s the thing, you don’t need to dedicate huge chunks of time to make a difference. The key is to develop a strategy to help you be more efficient with the time you’re already spending. For example, I often pop on some veg to roast (1 hour but 2 minutes active time) or cook up a pot of rice for Fergal and Finbar (15 minutes) while I’m cooking for today. If you’d like to explore more strategies for being efficient in the kitchen I’m going to be going much deeper in my new online program, The Organized Cook, which I hope you’ll join me for. Myth 3. Pre-prepared food is not as healthy as fresh. Just because fresh food is healthy, doesn’t necessarily mean that food cooked in advance is not. Whenever we cut or cook food we’re exposing it to oxidation and light or heat. So any light, oxygen or heat sensitive nutrients will be lost during food prep. Whether we eat the food straight away or store it and eat in a few days time doesn’t make a significant difference. Most of the sensitive nutrients will have already been lost either way. The way I look at it, if prepping ahead means I’m going to eat more veggies, this totally outweighs any slight loss in nutrition from prepping and storing. When I was growing up ‘salt and vinegar’ was my favourite flavour of potato chips (crisps). But it wasn’t until my brother was staying with me and cooked his version of these salt and vinegar steaks that I had the inspiration to use that classic flavour combo in my cooking. Thanks Dom! 1. Remove steaks from the fridge preferably an hour before you want to cook them, or as long as you’ve got. 2. For the dressing, combine vinegar with 2 tablespoons extra virgin olive oil. 3. Heat a frying pan on a medium high heat. Add a little olive oil and the broccoli / broccolini and a splash of water. Cover and cook stirring every few minutes until the veg are no longer crunchy, about 5-10 minutes. Place veg in a clean bowl. 4. Increase heat to medium high. Rub steaks with a little oil and sprinkle with salt. 5. Cook steaks for 3-5 minutes each side, or until cooked to your liking. 5. Place steak on 2 plates. 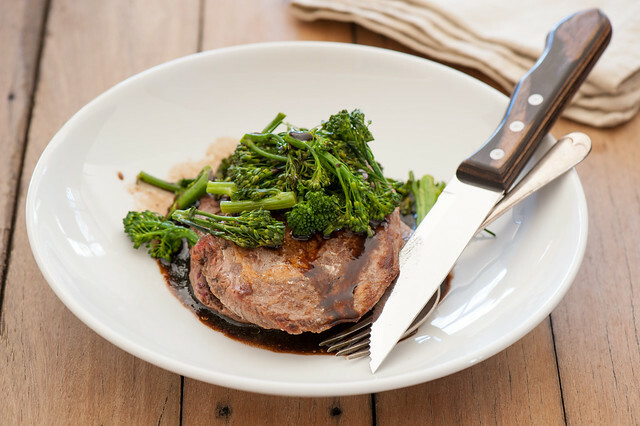 Drizzle over dressing and allow to rest for 5-10 minutes before serving with the broccolini / broccoli on top and extra sea salt flakes. different salt – my brother loves commercial garlic salt or onion salt with his steak. vegetarian – replace steaks with sliced halloumi cheese. Pan fry halloumi on a medium heat until golden brown on both sides. No need to rest the halloumi before tucking in. OR replace steak with hummus + a handful of almonds. vegan – try salt and vinegar beans. Replace steaks with a drained can of your favourite beans. Warm in the pan and serve with the veg and dressing. Consider adding a handful or roasted almonds or pine nuts for some extra protein and crunch. different veg – replace broccoli or broccolini with sliced zucchini, snow peas, frozen peas, sugar snap peas or red bell peppers (capsicum). Or just serve steaks with salad leaves on the side. more substantial – lovely with mashed potatoes, roast potato or fries, cauliflower mash or a packet of your favourite potato crisps (chips). Or just serve some crusty bread and butter. different meat – also great with pork chops, lamb chops or lamb cutlets. I also love salt and vinegar sausages (simmer sausages in water for 10-15 minutes before draining and browning in a little oil in the pan). pescetarian – replace steaks with fish and replace balsamic with lemon juice. 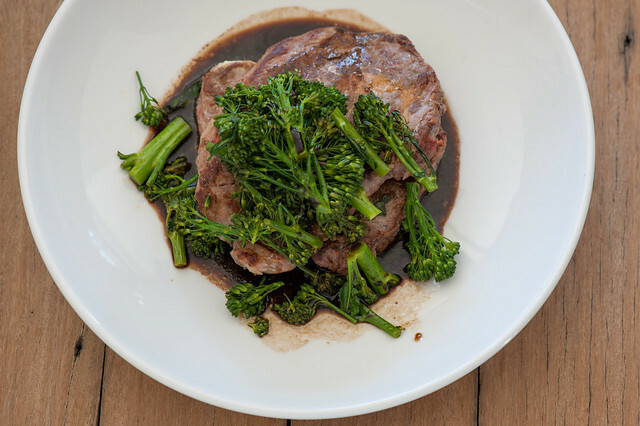 different vinegar / sugar-free – I love the sweetness of balsamic here but you could use any wine or rice vinegar. Sherry vinegar is also a hit. more veg – serve a green salad on the side. low carb – I use a cheap balsamic which is lower carb. For strict low carb use 2 tablespoons wine or sherry vinegar instead. For more easy Low Carb ideas check out my new website Deliciously Diabetic.